What are trail bike rallies? Rallies are like organised trail rides with a competitive edge to them. Typically they're one-day events but some take place over weekends. Wales is a favourite location, but you'll also find them up north in Yorkshire too. The terrain is by and large easy. Off-road rallies are made with big capacity dual-purpose bikes in mind. At the Cambrian Rally the course was made up of forestry logging tracks and small single-track trails. Via a road book, just like in car rallies. This is a succession of diagrammatic directions which you feed into a holder (essentially two rollers in a watertight box) mounted to the handlebars. Through timed special tests, of which there may be two or three a day. Here the road book gives way to an arrowed course, on which you travel as fast (or as slow) as you please. Do I need a 950 Super Enduro? 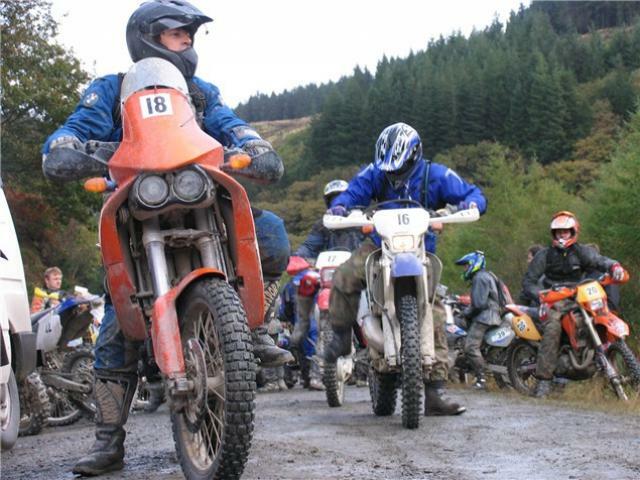 Most rally entries are made up of road-legal trail and enduro bikes. An enduro bike will make the course easy to ride, almost ridiculously so, but will suit older riders and beginners well. So no, you don't have to strap yourself to a 950cc ACME rocket. Must the bike be road legal? Yes. While rallies are run mostly off-road (Forestry Commission land is favoured), frequently they involve some roadwork so road legality is a must. Expect to pay £80-£100 for an entry fee. Not cheap, but there's lots of land involved, and land access costs. You will also need an ACU licence, or you can buy a one-day licence each time for £15 a pop.